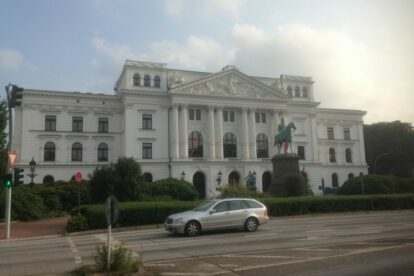 When I used to live in Altona, I sometimes had to go to the local city hall. Altona didn’t use to be a part of Hamburg till the mid ’30s so it got its own beautiful builing which was at first built as a train station and just “recently” turned into a city hall. It is an inspiring white building which looks very classy to me and I enjoy seeing people having their wedding there (mostly on Fridays during summer time) or the local residents performing their 30th birthday of bachelors (there are some weird traditions in Germany, I can tell you… 😉 ). It is located nearby the “Altonaer Balkon” (check out my article “Altona Elbeview – Nicest benches with a view”) and my favourite benches with a river view, so just drop by and enjoy the neo classicism. And the weddings, or the summer arthouse cinema that is sometimes going on there in the courtyard during July and August, organised by Zeise Kino and which is called “Zeise Openair”.